Mercedes-Benz has provided an early glimpse of its upcoming BMW X3 rival, the GLC, with the unveiling of the Concept GLC Coupé at the Shanghai motor show. The production version of the GLC is due to appear later this year with similar styling, dimensions and mechanical package. The high-riding four-door coupé also serves as a thinly veiled preview of a new BMW X4-rivalling sporting SUV that will take the GLC Coupé name into production in 2017. At 4727mm long, 2000mm wide and 1593mm tall, the GLC Coupé is 57mm longer, 120mm wider and 28mm lower than the X4. It also rides on a wheelbase that is 17mm longer than the BMW’s, at 2827mm. Compared with the outgoing GLK, it is 192mm longer, 160mm wider and 77mm lower. The sporting SUV rides on a modified version of Mercedes’ modular high-strength steel MRA platform, as found beneath the latest C-Class. It is allied to an aluminium-intensive suspension that uses a combination of double wishbones up front and multi-links at the rear. Although it has not been officially confirmed, Autocar can reveal that production versions of the new GLC and its swoopy-styled GLC Coupé sibling will have the option of rear air springs, following the lead taken by the C-Class. Power for the new concept car shown in Shanghai comes from a twin-turbocharged 3.0-litre V6 petrol engine, one of a number of units that will be made available on the new GLC and the production version of the new concept, according to senior Mercedes sources. The twin-turbo V6 kicks out 362bhp and 383lb ft of torque — 60bhp and 88lb ft more than the most powerful petrol-powered X4 model, the xDrive35i. This particular engine is set to power a GLC450 Coupé AMG model, in line with moves made with the larger GLE450 Coupé Sport shown earlier this year. Channelling these reserves to all four wheels is Mercedes’ new nine-speed 9G-Tronic automatic gearbox and 4Matic four-wheel drive system. 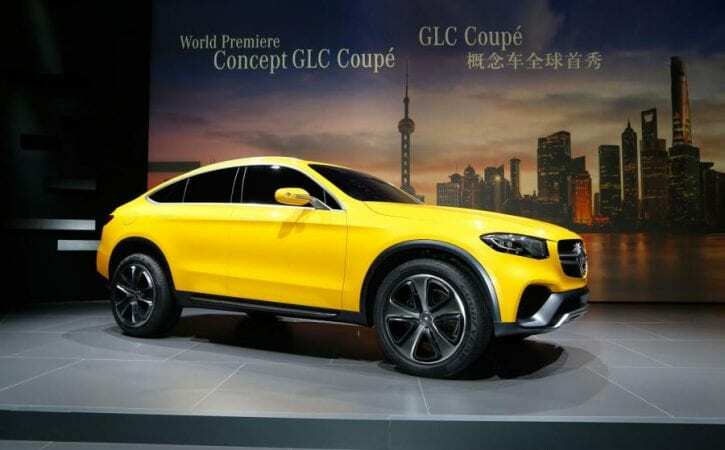 In a clear hint that Mercedes intends to put the Concept GLC Coupé into production, officials revealed in Shanghai that the company’s SUV line-up would eventually extend to seven models. Included is the GLA, GLC, GLC Coupé, GLE, GLE Coupé, GLS and traditional G-Class, which is set to be substantially updated in 2017.